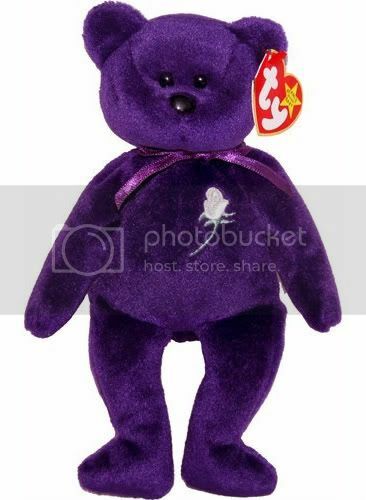 THE #1 (VERY FIRST) PRINCESS BEANIE BABY BEAR EDITIONSHOULD ALWAYS HAVE THE FOLLOWING DETAILS* Beautiful Royal Purple Polyester lush & plush fur with matching Purple Ribbon. IMPORTANT: PVC pellets were the first pellets! They were replaced with PE pellets. Verified through Ty. Therefore the PVC Tush Tags were created first & were the first Princess Beanie Babies made. Sellers with PE tush tags are incorrect. DO NOT BE MISLED. Please read the Princess Beanie History below for all the correct information on every detail including photo proof. * Extremely Limited Edition ~ The China PVC issue is the very first Princess Beanie Edition. Not like the several hundred PE 5th & 6th Editions as seen today on the Internet & eBay claiming to be the First Edition. The world to share, to give, to reach. TY© PRINCESS BEANIE BABY BEARS®* Ty Beanie Baby 'Princess' the bear was announced on October 1997 & issued in December 1997 as a charity release for the Princess Diana of Wales Memorial Fund. All of Ty Inc's profits from the bear were donated to the fund. The Princess Beanie Baby was retired on April 13, 1999. PVC PELLETS VS PE PELLETS* The pellet issue helps to define which came first. P.V.C. stands for Polyvinylchloride & P.E. stands for Polyethylene. 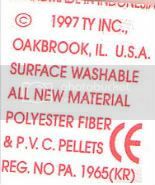 Ty stopped using PVC pellets in favor of using PE pellets as these were considered to be more environmentally friendly. Beanies with PVC pellets tend to be more rare & therefore more valuable. Know the facts! PVC WAS INVENTED FIRST ~ DUH! * Please read all the PD Beanie Baby History information on this post. The information is vital to the truth about the extreme rarity of the real #1 PVC's. There would never be PE Beanies of any kind if Ty wasn't forced by Green Peace to change over from PVC to PE!!! The only thing that matter's is what is on the Tush Tag, not some bogus CIA/FBI test to see what the Beanies are filled with. LOL!!! BRIGHT GREEN STEM VS PALE GREEN STEM* The bright green stems are on the first two editions. The pale green stems are on the later editions of the Princess Beanie Babies. * #1 FIRST EDITION SWING TAG & CHINA PVC TUSH TAG RETIRED 1997In December 1997 the PE pellets replaced the PVC pellets. The second edition PE Tush Tag was created. The PVC Tush Tag came first & the PE Tush Tag came second. The Beanie Vendors received both PVC & PE bears for sale at the same time in January 1998. Ty knew that the PVC Princess Beanie Bear was so rare that they only allowed one PVC Bear 1st Edition to be included with eleven PE Bear 2nd Editions for each Beanie Vendor to sell. That's why there are so many PE Bears for sale & only a handful of PVC Bears for investment. * #4 FOURTH EDITION SWING TAG & INDONESIA PE TUSH TAGRETIRED 1998Top of PE Tush Tag says Handmade In Indonesia. * #5 FIFTH EDITION SWING TAG & CHINA PE TUSH TAGRETIRED 1999The Swing Tag on the right side has a double space above Diana, Princess Of Wales Memorial Fund. This double space appears on all Fifth Editions. The Fifth Edition was the issue that started the mass production. These 5th Editions do not have the dreaded stamped numbers which denote assembly line or factory control numbers. WITH COMMON STAMPED FACTORY NUMBERSThe 40 million mass produced 6th Edition Tush Tags contain an oval & number stamped in red or pink on the inside of the loop. There were several different numbers denoting different assembly lines or factory control numbers. BEWARE: Seems like several hundred of these 5th & 6th Editions ended up on eBay claiming to be the first edition. 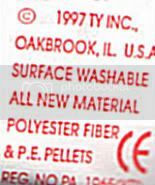 BEWARE OF THE TUSH TAGS WITH STAMPED NUMBERS* Princess Diana Beanie Baby Bears with a number inside the Tush Tags are the worthless mass produced bears that exceed 40 million made! PLEASE DO NOT BE FOOLED BY GREEDY SELLERS giving false information about these bears. The stamped numbers inside these tush tags represent Factory Control Numbers or Assembly Line Numbers & NOTHING ELSE. Many of the honest Beanie Dealers that sold this bear will confirm this. THERE WAS NEVER A FIRST EDITION BEANIE EVER MADE WITH A STAMPED NUMBER THAT MEANT IT WAS A NUMBERED EDITION BEANIE!!! AND the stamped worthless Princess Diana Beanie Baby Bear will also have the Heart/Swing tag with the very noticeable double split in the paragraph above Diana, Princess Of Wales Memorial Fund, like the 5th Edition PD Beanie Bear. DENOTING THIS IS THE DREADED 6TH EDITION BEAR WITH A STAMPED FACTORY ASSEMBLY LINE NUMBER!!! NUMBERS DENOTING MASS PRODUCED PD BEANIE BABIES* 400, 401, 403, 416, 418, 425, 433, 450, 464, 472, 474, 477, 481... I've personally seen several 481s at a local brick & mortar toy store. If anyone else has a stamped number inside the Tush Tag, PLEASE leave the number in the Leave Comment ~ Q&A area so I can include these numbers on this auction ~ Thank You ALL for leaving your numbers ~ Many are repeated (especially #403) proving that these are the 6th Edition PD Beanies with assembly line numbers. 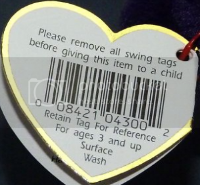 IMPORTANT TO NOTE* All Princess Beanie Baby Swing Tags are the same front & back. 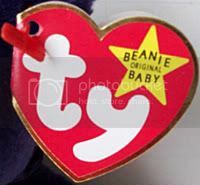 * All Princess Beanie Baby Tush Tags are 1997. The year on the tush tag is the copyright year for that specific design of the Tush Tag not the production. PRINCESS BEANIE BEAR BUDDY SWING TAG* Only the Princess Beanie Bear Buddy has the official Diana charity emblem or logo on the inside of the Swing Tag, all the Princess Beanie Baby Swing Tags do not. PRINCESS DIANA BEANIE BEARS SHOULD BE AUCTIONED FOR CHARITYPAY IT FORWARD ~ A GIVING HEART IS A PURE HEART...This was the original purpose for manufacturing & selling the Princess Diana Beanie Baby Bear! Princess Diana's philanthropic endeavors greatly endeared Diana to the hearts of the world & live on as her legacy. The Diana Princess of Wales Memorial Fund was established in her honor. She is remembered not only for the money her name could raise, but also for the loving acts she bestowed on so many. She was the "People's Princess." her life began in a fairytale fashion; yet, she rose to demonstrate to the world that one can overcome adversity & leave a meaningful legacy. She restored a sense of mission & humanity to the monarchy of England as well as the world. The Princess Beanie Baby Bear on this post is part of our personal Cool Collectibles Collection. For more information & PICs of our Princess Diana Memorabilia & COOL COLLECTIBLES please click above. Thank you for the info! It was really helpful to me! I figured out that I have a first edition Princess Diana bear. Now to figure out how to do the ebay thing, which I haven't done before! Hi Karriesue3, thank you for your comment. I did 100s of hours of research. Even contacted Ty & Beanie Vendors to verify the facts. Good luck with eBay... Everyone should have an eBay account for buying & selling. It's the great Flea Market of the World! Hi Jadoo, you're welcome. The truth will hopefully stop Beanie Seller's from trying to pass off any Princess Beanie Baby Bear from being a 1st Edition. AND also hopefully inform Princess Beanie Baby Buyer's that the PVC CHINA PRINCESS BABY IS THE TRUE FIRST EDITION PRINCESS BEANIE BABY BEAR! A wonderful investment at any price, as this PVC Princess Beanie will continue to grow in value!!! I wondered if you could help. I have been sorting through my old beanies and realised I had a diana bear but can't work out which one. It has PE pellets and a bright green stem and a red stamp on the inside of the tush tag stating "481". However, the Ty tag does not match any of the pictures. It matches except for the middle line on the left side which states "Ty Europe. Gasport, Hampshire, U.K.
Could you clarify for me? Hi, yes we can figure out what PD Beanie Baby Bear Edition you have. #1 Is your PD Beanie's Tush Tag PE CHINA or PE INDONESIA? It's easy to see if you have the 5th Edition, The Swing Tag on the right side has a double space above Diana, Princess Of Wales Memorial Fund. This double space appears on all Fifth Editions. The Fifth Edition was the issue that was mass produced. Many of the 5th Editions Tush Tags contain an oval & number stamped in red or pink on the inside of the loop. There were several different numbers denoting different assembly lines or factories where that Beanie Baby was made. Seems like several hundred of these 5th Editions ended up on eBay. Please answer those two questions here & the answer to what you have may be that easy. * P.S. I believe there may be a SIXTH EDITION, as you are not the first person to ask this question. PD BEANIE BABY SIXTH EDITIONS: The Tush Tag would be PE INDONESIA (usually from the UK) & stamped in red or pink with a number on the inside of the loop. The Swing Tag matches the fifth edition with the double space above Diana, Princess Of Wales Memorial Fund... Again those PD Beanies were the last mass production & are give aways. Lyndy I need help. I have a princess bear. I think it is a second edition but I am not sure. The swing tag looks simaler to the second edition , but it has a double space between the poem and the memorial fund statment. It is handmade in China, it has PE pellets but it has a dark green stem on the rose. I also have a Spooky with no mouth. It has PVC pellets. #2 Edition: The Swing Tag on the right side has no double space above 'Diana, Princess Of Wales Memorial Fund'. Please look at the #2 photo reference again. If your tag looks like the #2 Edition, than it's probably a #2 Edition. #5 Edition: The Swing Tag on the right side has a double space above 'Diana, Princess Of Wales Memorial Fund'. Please look again at where this double space is on the #5 photo. The double space is between the 'All profits of Ty from this collectible will be donated to the' (DOUBLE SPACE HERE) 'Diana, Princess Of Wales Memorial Fund'... This double space appears on all Fifth Editions. P.S. Still Confused? Do you have an Internet site where I can view your PD Beanie online? No I don't have a web site but if you give me your email I will gladly send you pics of it and the Spooky I was telling you about. Hi Suziex, yes you have a #3 Edition PD Beanie Baby Bear. The PRINCESS DIANA BEANIE BABY BEAR HISTORY states: INDONESIA PVC TUSH TAG IS THE THIRD EDITION. Does your Swing Tag match this edition's Swing Tag? Hi I have a question about my beanie baby. The Address for TY Europe is Gasport, Hampshire, UK. It is made in China, has the bright green stem, the double space above Diana, Princess of Wales, and is made of P.E. pellets. It also has a 481 stamped on the inside of the tush tag. I would appreciate your help. what does it mean if my princess doesnt have a ribbon?? You have a 5th Edition PD Beanie Baby. The Swing Tag on the right side has a double space above Diana, Princess Of Wales Memorial Fund. This double space appears on all Fifth Editions. The Fifth Edition was the issue that was mass produced. Many of the 5th Editions Tush Tags contain an oval & number stamped in red or pink on the inside of the loop. There were several different numbers denoting different assembly lines or factories where that Beanie Baby was made. Seems like several hundred of these 5th Editions ended up on the Internet & eBay claiming to be the first edition. We are selling 5th Edition PD Beanie Baby Bears for $14.99 on eBay & also giving a portion of that to eBay Giving Work's Charities. Great information thanks. We have a princess bear with bright green stem, star by ty logo on tag made in Indonesia 1997 with PE pellets is this a 4th generation or 2nd generation hope you can help. Hi, I am assuming I have a 5th edition of this bear. Now what is the difference between the tush tags that have the number in the circle on the tush tag and ones that don't? Guess that is all the clarification I need, Thanks. Ok I don't know if this posted, but what is the difference in the tush tags that have the number in the circle and one that doesn't? * #4 FOURTH EDITION SWING TAG & INDONESIA PE TUSH TAG ~ RETIRED 1998 ~ Top of PE Tush Tag says Handmade In Indonesia. The Swing Tag on the right side has a double space above Diana, Princess Of Wales Memorial Fund. This double space appears on all Fifth Editions. The Fifth Edition was the issue that was mass produced. Many of the 5th Editions Tush Tags contain an oval or circle & number stamped in red or pink on the inside of the loop. There were several different numbers denoting different assembly lines or factories where that Beanie Baby was made. Seems like several hundred of these 5th Editions ended up on eBay claiming to be the first edition. P.S. The only difference with the 5th Editions that do not have that stamped factory assembly number is that they (the unnumbered PD Beanies) were probably the first of the last 5th Editions to be produced. Thanks Lyndy for sharing this information I have worked out that I have a 3rd edition. Do you know how much this is worth please. I'm really glad I found your site. I now know I have a 1st edition as well as a 5th edition. Thank you for the info!!!!! I'm pretty certain I have a 2nd edition. Do you have any idea what it is worth? Great information. I have a quick question. I have a princess baby that has a hanging tag that is double spaced like the 5th ed, but it has a bright green stem, pe pellets, and was made in China. Even though it has a bright green stem, is it still a 5th ed because of the hanging tag? Thanks for the help! 100s of people just like yourself have been asking for advice on this PD Beanie Blog & my PD Beanie Baby Bear Ebay Auctions. I'm in the process of writing an eGuidebook on Princess Diana Beanie Babies & helpful hints on the Beanie Baby Market. This will be out shortly, until than you'll just have to check the Internet & eBay for Beanie Baby research into the question you're asking. Unfortunately the uninformed will continue to flood the Beanie Baby Market with crazy pricing on the mass produced 5th Edition Princess Diana Baby Bear & the PVC/PE controversy which confuses the buyers & therefore nothing sells at the right price. You do not have a 2nd Edition. Sorry, but you have a worthless mass produced 5th Edition. TY NEVER NUMBERED ANY OF THERE BEANIES EVER!!! The Swing Tag on the right side has a double space above Diana, Princess Of Wales Memorial Fund. This double space appears on all Fifth Editions. The Fifth Edition was the issue that was mass produced. Many of the 5th Editions Tush Tags contain an oval or circle & number stamped in red or pink on the inside of the loop. There were several different numbers denoting different assembly lines or factories where that Beanie Baby was made. Seems like several hundred of these 5th Editions ended up on eBay claiming to be the first edition. 40 million of these mass produced PD Beanie Bears were sent to market. P.S. The only difference with the 5th Editions that do not have that stamped factory assembly number is that they (the unnumbered PD Beanies) were probably the first of the last 5th Editions to be produced & these unnumbered 5th Edition Beanies are worth around $15.00. P.S. I will be adding a photo to this post of the mass produced stamped numbered 5th Edition Tush Tag ~ ASAP. Hi Lakota, thank you for your comment. I'm glad I could help you. I'm in the process of writing an eGuidebook on Princess Diana Beanie Babies & helpful hints on the Beanie Baby Market. Hopefully this will help Beanie Collectors & Sellers establish a true value with correct information. Hi Armywife, please send or give your hubby a great big HUG from his fellow Americans for his courage to defend human rights & his patriotism. So sorry but your PD Beanie is a 5th Edition. The double spaced Heart/Swing Tag is the proof. Some of these 5th Editions have bright green stems & always PE pellets. That's why the only sure way to tell what edition PD Beanie Baby Bear one really has is with the Heart/Swing Tag information. The Swing Tag on the right side has a double space above Diana, Princess Of Wales Memorial Fund. This double space ONLY appears on all Fifth Editions. I suppose an Indonesian swing tag with no space in the last 4 lines on the right side of the swing tag would cause a problem or two for your theory. Two of those are sitting on the desk in front of me. Your 40 million production guess is interesting. Where did that number come from? Hello. I was thinking about listing some of my beanies on Ebay and was shocked how much the Princess Diana beanie babies are going for. I am pretty sure I have a Princess beanie, but no idea offhand what edition it is. All of my beanies were put into ziploc bags the day they were bought and stored in a closet. They should all be perfectly mint. I bought them as a long term investment at the time. I put as many tag protectors on as many as I could afford back then. Offhand I don't know how many that would be. My question is this: If someone DID have a first edition Princess Diana beanie baby what is the REAL value of it currently? Ballpark. I see crazy prices on Ebay but I don't know if that is just seller's greed or the buyer's real prices. Thank you! This is a great, informative web page. Thank you for the help. I seem to have the 2nd edition of this Princess bear. Do you know the value of it? What if I have a princess Diana one that has an orange dress on and a vail and a necklace? I haven't seen many like this. Quick question: Mine is the 5th Edition PD without the stamp on the tush but, on the inside of it, there is a faintly handwritten number (2) that has been there since I bought it. Hi, I have recently bought the Diana Beanie Buddy for my daughter as a gift for mine and my husband's 2nd Anniversary. She loves it but I'm not sure how to tell if it's just a replica or fake. She loves it regardless but it would be great to tell her when she's older the story behind it and make sure she takes care of it. The tag matches the picture but there's very little information anywhere about the tooshie tag with hand made etc on it. let alone how much it should be in a shop. Any information/help would be much appreciated. THIRD EDITION SWING TAG & INDONESIA PVC TUSH TAG RETIRED 1998 (The photo shows no space on last 4 lines of swing tag). FACT: There would never be PE if PVC wasn't forced to be replaced by PE. FACT: TY Authorized Retailer's will tell you the truth "ALL PVC BEANIE BABIES ARE ALWAYS THE MOST COVETED & RAREST ALWAYS WORTH THE HIGHEST VALUE!" FACT: It doesn't matter what the PD Beanie Baby is filled with, the value is in the TUSH TAG & what the tag states. MEANING: Beanie Editions are verified by their TAGS! FACT: In December 1997 at a TY Authorized Retailer, we stood in line in the pouring rain between 2-4 AM just to get a lottery ticket so we could purchase (when the PD Beanie Baby became available) for $200-$250 a PVC PD BEANIE BABY! Not a PE, the retailer's reason was that the PVC was only 1 in 12 across the nation!!! P.S. TY Beanie Dealers as will as TY Authorized Retailers reported that 40 million PD Beanies flooded the market in 1999... This caused TY's Beanie after market resale to plummet... Check the Internet. I know it's confusing with all the crazy eBay auctions for Princess Beanie Babies. The prices are off the charts. We personally have already spent several thousand dollars for Princess Beanie Baby Bears. We have done our research & it's up to the market what someone will be willing to pay for the real 1st & 2nd Editions. We probably will need to start flagging all the eBay sellers trying to sell a 5th edition as a first or 2nd edition. They are confusing the market & ruining the selling point, meaning a true investment selling price. We have listed a 2nd Edition on a 7 day auction for $499.99 with a percentage going to charity, but zero takers. I personally think that $499.99 is a very reasonable price for that edition. A few weeks ago we listed a 7 day auction #2 PD Beanie Baby for $290 with a percentage going to eBay & still no takers. Our eBay store prices reflect what the PD Beanie Baby Market should be rounding up or down to. Hope this helps. FYI: At this time we only buy from eBay Dealers that we are familiar with or Authorized Beanie Retailers. We have listed a 2nd Edition on a 7 day auction for $499.99 with a percentage going to charity, but zero takers. I personally think that $499.99 is a very reasonable price for that edition. A few weeks ago we listed a 7 day auction #2 PD Beanie Baby for $290 with a percentage going to eBay & still no takers. Our eBay store prices reflect what the PD Beanie Baby Market should be rounding up or down to. Our eBay store prices for a PVC #1/$29,000 & PE #2/$2,900. Hope this helps. * Only the Princess Beanie Bear Buddy has the official Diana charity emblem or logo on the inside of the Swing Tag, all the Princess Beanie Baby Swing Tags do not. What makes you think you have a fake PD Beanie Bear Buddy? I'm in the middle of writing the PD Beanie Baby Bear History eBook, so I most likely will include the PD Buddy Bear Tush Tag in the eBook with all the updated information. I'm very excited to announce there really is a Princess Diana Beanie Baby Bear #6. All the details of the Sixth Edition PD Beanie Baby Bear will be in my eBook. I have heard that the address is rare on mine is rare because Gasport is a typo, it is actually supposed to be Gosport. Yet, mine does have the p.e. pellets. It seems like you know a whole lot about this topic so I wanted your opinion. Oh, by the way, it does have a bright green stem and it has the number 481 stamped inside the tush tag. WITH ALL THE MISINFORMATION ON THE PD BEANIE BABY BEARS: I'm now in the process of writing an eGuidebook on Princess Diana Beanie Babies & helpful hints on the Beanie Baby Market. TY NEVER NUMBERED ANY OF THEIR BEANIES EVER!!! The Swing Tag on the right side has a double space above Diana, Princess Of Wales Memorial Fund. This double space appears on all Fifth Editions. The Fifth Edition was the issue that was mass produced. Many of the 5th Editions Tush Tags contain an oval or circle & number stamped in red or pink on the inside of the loop. There were several different numbers denoting different assembly lines or factories where that Beanie Baby was made. 40 million of these mass produced PD Beanie Bears were sent to market. LOOKS LIKE THESE FACTORY NUMBERED 5TH EDITIONS ARE REALLY A SIXTH EDITION... The difference with the 5th Editions that do not have that stamped factory assembly number is that they (the unnumbered PD Beanies) were probably the first of the last 5th Editions to be produced. These UNNUMBERED 5th Edition Beanies are worth around $20 - $45 depending on the condition of the PD Beanie Baby Bear & the condition of the tags. Hi, I just came across this post after doing a google search. My Princess bear has all the characteristics you mentioned for first edition. However, it also has a tear in the left eye. It is made of felt and is white. It was my understanding that TY originally decided to make only 800 Princess bears. These first 800 were the ones with the tear. 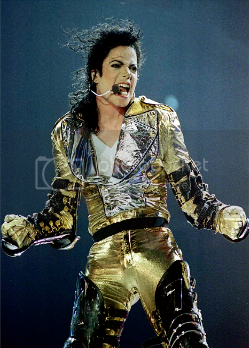 However, I cannot seem to find any information on the tear, and it seems that no one knows about it. I am by no means a Beanie Baby expert, and I thought maybe you would be able to shed some light on this. Hello! Thanks for the info on the PD bear! 2 quick questions please: #1 What is a 5th edition PD bear worth and #2 My PD bear came with a long plush purple cape with a soft white fur-like lining on the fringe. Have you seen this before? Thanks again for your time! We wish all the greedy dishonest sellers would stop flooding the PD Beanie category with false information. It's confusing the buyers & therefore nothing sells at the right price. * MACHO: * UPDATED STAMPED # INFORMATION * BEWARE OF THE TUSH TAGS WITH STAMPED NUMBERS INSIDE!!! Your PD Beanie Baby #400 is a mass produced Beanie showing up everywhere. Princess Diana Beanie Baby Bears with a number inside the Tush Tags are the worthless mass produced bears that exceed 40 million made!!! PLEASE DO NOT BE FOOLED BY GREEDY SELLERS giving false information about these bears. The stamped numbers inside these tush tags represent the factory or assembly line they were produced on & NOTHING ELSE. Many of the honest Beanie Dealers that sold this bear will confirm this. THERE WAS NEVER A FIRST EDITION BEANIE EVER MADE WITH A STAMPED NUMBER THAT MEANT IT WAS A NUMBERED EDITION BEANIE. AND the stamped worthless Princess Diana Beanie Baby Bear will also have the Heart/Swing tag with the very noticeable double split in the paragraph above Diana, Princess Of Wales Memorial Fund, DENOTING THIS IS A 5TH EDITION BEAR!!! The stamped #403 bear is one of these worthless bears. Dishonest sellers are claiming this is a numbered bear. Yet several of these #403 bears are showing up for sale on eBay, PROVING that it's a factory number & not an OOAK (Original One Of A Kind). To reiterate: THERE WAS NEVER A FIRST EDITION BEANIE EVER MADE WITH A STAMPED NUMBER THAT MEANT IT WAS A NUMBERED EDITION BEANIE. The other numbers denoting the mass produced PD Beanie Babies are: 400, 403, 416, 481... I've personally seen several 481s at a local brick & mortar toy store. If anyone else has a stamped number inside the Tush Tag, PLEASE leave me a comment with the number so I can include these numbers on this post ~ Thank You! so how much is the 5th edition worth? This is really cool info. Read all 51 post. I feel very knowledgeable now about PD bears. Thanks for what you've done. Do you know if there is any value in other PVC Beanie Babies? Looks like I have (3) 2nd editions and (2) 5th. I told my wife it would pay off someday 14 years ago. First thought I had a second addtion, til seeing the number on the inside of the tush tag. You can add #472 to the list of 5th or 6th editions as this is the number on my Diana beanie. 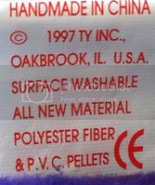 Miss Lyndy, I am still trying to get information on a Princess di beanie: The swing tag has the double space, It says handmade in china, Tush tag says Pe Pellets, but it has NO oval or number stamped in red or pink on the inside of the loop? The inside of the loop is blank. Any idea?? What editon this is. If No stamped number then it would not be mass produced right?? QUICK QUESTION SORRY STILL A BIT CONFUSED. HAND MADE ON TUSH TAG, ONE PARAGRAPH FOR PD POEM SECOND PARAGRAPH FOR MEMORIAL FUND, RED STAR ON SWING TAG TOP LEFT OF HEART, R IN CIRCLE LEFT OF THE WORD COLLECTION AND A R TO BOTTOM RIGHT OF HEART ALL ON SWING TAG, GETTING OUT OF BREATH. LOL A 4TH EDITION AND IF SO WORTH AROUND $4? REASON I SAY THIS AS WHEN YOU MENTIONED PRICING ONLY PRICED FOR MADE IN CHINA BUT NOT INDONESIA. I THIS NOT ACCEPTING POSTS ANYMORE????????? I have tried several times to no avail. Just wondering in this site is kinda on auto pilot now?? I am still trying to get information on a Princess DI Beanie: The swing tag has the double space, It says handmade in china, Tush tag says PE Pellets, but it has NO oval or number stamped in red or pink on the inside of the loop? The inside of the loop is blank. Any idea?? What edition this is. If No stamped number then it would not be mass produced right?? Thanks for the info!!!! Very helpful. 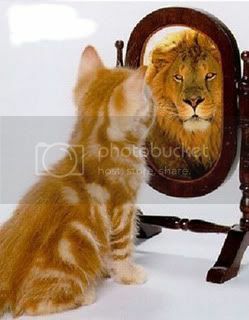 But mmmm, mines a fake! The number on the inside is 474. Hey Lyndy my name is Kaylee and I live in NW Arkansas. I'm 99% sure I have the 1st edition Ty Princess Diana bear. The tush tag reads "the beanie babies collection. The pic of the heart with Ty in the middle of it and a star to the upper left side of it. Under it Princess. Handmade in China. 1997 Ty. Inc. Oakbrook, IL USA. Surface washable. All new material. 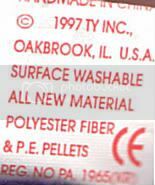 Polyester Fiber & P.V.C. Pellets. Reg. NO PA 1965 (KR)" And everything else looks exactly what you have pictured in your 1st edition. How much is it worth? The prices on eBay range from $4 to a million dollars. Where is the best place to get it appraised and to find a buyer? Thank you very much for your time! I won the Beanie Baby at a Restaurant, which had a gift shop attached and was a reputable Beanie Baby dealer. I am fairly certain that it is not a knock off. Do you think it is possible that people just don't know about them? I contacted TY but they never got back to me. Any thing you know to look for that could be a sign that this is counterfeit? First off, thank you for your time and effort to bring this researched information to light. I have a question concerning the numbered PD beanies. There is a PD beanie online numbered 172. Is this still one of those "worthless" beanies? There are several sites claiming information about the different editions, but they do not all seem to agree with what details differentiate between them all. For example, my PD beanie has no double spacing in the heart tag, no number in the tush tag, a light green stem, a red star in the upper left of the tush tag, a purple ribbon around its neck, and says MADE IN INDONESIA with PE pellets. According to your information, I have a 4th edition PD Beanie Bear. Am I right? How many of these were made? And how much do you think it's worth? With a couple family members, I managed to get one of the first bears released, or so I thought, not knowing which edition I was getting. Hi Lindy, I have a 1st edition, PVC, made in China, Princess Diana bear in absolute MINT condition (We sealed it within a display case immediately upon purchase, and it has never been opened). It matches your tags exactly for the first edition description on the tush tag as well as the hang tag. The hang tag has also been in a protector since purchase. I would like to obtain a certificate of authenticity before considering selling it (because of all the fakes and misinformation out there). The places I have found online where I could get it authenticated ask for it to be mailed to them, and I'm not comfortable letting it out of my possession because of its possible value. Can you recommend a reputable company, or recommend a way to find someone local who could do this for me? I'd also very much like to have this done with an appraisal for actual value. ANONYMOUS: ASKED & ANSWERED TOO MANY TIMES BY MANY OTHERS; The 5th Edition is worth $15.00 - $49.00 depending on condition. GLENN/CHRISTY: ASKED & ANSWERED TOO MANY TIMES BY MANY OTHERS; You have the 5th Edition. The 5th Edition does not have the stamped numbers inside the Tush Tag. The 6th Edition has the stamped assemble line numbers. The 5th Edition was the start of the mass production. We just sold a MWMT 5th Edition for a whopping $14.99 (that's fourteen dollars & ninety-nine cents) & a percentage of that went to an eBay Official Charity... I will not sell this MWMT 5th Edition again for less than $49.00. There are many subtle differences between the 5th & 6th Editions. ANONYMOUS: Thank you for adding #472 to the 6th Edition assemble line stamped numbers. This has been added to the PD BEANIE BABY BEAR HISTORY post. ANONYMOUS: Is your Indonesia PD Beanie Baby a PVC or a PE? There is a big difference in price. The PVC/Indonesia is the 3rd Edition & the PE/Indonesia is the 4th Edition. AND if you read through all the comments posted you would have your answer. LORNA: PVC/INDONESIA is the rare 3rd Edition worth around $1000.00 - $1500.00+ depending on condition. Value is subjected to the market at the time of the sale. ANONYMOUS: Yes, I'm still accepting comments to post. But I will not continue to answer the same questions over & over again if someone else already asked that same question. 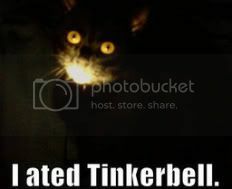 PLEASE READ ALL THE POSTS as they will help every one with the truth about PD Beanie Babies. Some of these posts are quite interesting in that so many people were lead to believe that they & they alone have the HOLY GRAIL PD BEANIE BABY ~ LOL! THANK YOU all for your interest in the PRINCESS DIANA BEANIE BABY HISTORY & KNOWING THAT THE TRUE #1 FIRST EDITION IS THE PVC/CHINA PRINCESS DIANA BEANIE BABY!!! ANONYMOUS: Thank you for adding #474 to the 6th Edition assemble line stamped numbers. This has been added to the PD BEANIE BABY BEAR HISTORY post. IMPORTANT: You do not have a fake, you have a 6th Edition with a stamped assemble line number. Worth $5.00 - $10.00 depending on condition. WOOZUG: AGAIN OMG! Ty Inc. never made a PD Beanie Baby Bear with a white felt tear in it's eye. I would like to know what the Tush & Swing Tags say. ANONYMOUS: PE/INDONESIA is the 4th Edition. It's rare because the Indonesia factory shut down after they switched to PE pellets. The value is probably around $200.00 - $300.00+ depending on it's condition. BEWARE: There is no #172, it's probably #472. This greedy seller must have tampered with the stamped Tush Tag of their 6th Edition mass produced bear making it totally worthless. 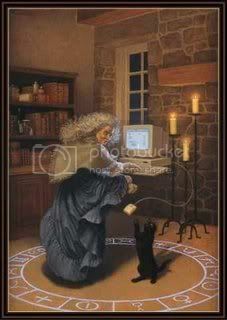 RON: What ever your Grandmother left you is on my PD BEANIE BABY BEAR HISTORY POST. Just match your Tush Tags & Swing Tags with the tags I posted. Read the information about those tags & you should know exactly what your dealing with. Lyndy, THANKS SO MUCH for taking the the time to do all the research & provide all this info to us, and answer our questions. I found it all extremely helpful. With all your info I was able to find out that I have 3, 5th editions, but one is without a number contained in an oval in the tush tag!!! The numbered ones are 433 & 472. Please add 433 to your list. Thanks again! I have a 5th Edition Princess Diana Beanie Baby. The UPC is 008421043002 and there is NO stamped numbers inside the tush tag. How much is it worth? I have a princess beanie with a beaded/feather necklace on her... Do you know anything about this one in particular? Hi Lyndy just wanted to let you know that I was so excited when I found my Princess beanie and saw it priced at $1,000,000... I was skeptical. I found out though mine is the 5th ed. and has a new number in the tag for you to post: 447. Do you know a good way, alternate to eBay to sell beanie babies? i have a pd buddy seems to be identical to the tag thats displayed, please if so how much would its worth. is it possible to bring all of our beanie babies to find out whether or not their worth anything. My princess beanie baby has the number 425 stamped on the inside of the tag. Hello lyndy, I must say you have given me the information I have looked all over for. After reading your information I have learned that my daughter has two of Princess Diane 2nd edition. I started her collection around 1994 (when she was born) and have several beanie babies that are rare. She is gettn her stuff down sized to move to college and wants to get rid of the collection for funds to buy a house around the university (after 1st yr of manditory dorm, no need to pay rent, invest) Do you have any information or list of collectors that would be interested in purchasing the collection? I come across your site after searching on information about a PD beanie baby. After reading over your site, I got such an energy burst from your inspiring site. You send out a very strong energy (in a wonder way) and just wanted to thank you for making my day better. I think when I start gettn down I'll just come back to your site and get a vibe of energy and hopefully I'll be back up on a high. Hello I own a princes beanie bear 3 edition handmade in Indonesia with PVC Pellets. IS this a rare Princess, and would you have an idea of the value. Hi I just posted but not sure if has come up could u email me @ threetimesababy@yahoo.co.uk. So I would b able to send u a pic as I can't work out one of my Diana bears I have three but one seems to have a mix up of all the tags etc. Thanks deanne. I have seen noone has posted on here for a while.. I have got one of these bears but all the mixed information has left me rather confused. I'm just wondering if you could help as you seem to know alot about these bears. My princess ty bear is handmade in Indonesia, it says so on the ty tag and bottom label.. it is also a p.v.c pellet bear! i wonder if you could tell me the edition of it and roughly how much these bears are selling for, it would be a shame to sell as such a beautiful bear with a loving and kind poem..
Ok i was wondering i have a ty beanie baby that i think is the 1st edition of princess diana bear it is in mint condition and the tag on its bottom has it is from china and has pvc pellets in it.. was given it several years ago from my mother and was wondering what it is worth.. Please let me know if there is any other way to tell if it is the first i see alot on ebay with numbers on them mine does not have a number of a series. Please let me know. Hi, Im about to sell a 3rd edition bear and i was wondering whether i'd be able to reference your website in the description of the bear so that they can use your knowledge and research to validate my description? TO REITERATE: PLEASE READ ALL THE COMMENTS & ANSWERS BEFORE ASKING THE SAME QUESTION TO WHICH I HAVE ALREADY ANSWERED. ANONYMOUS 2/15/12: You do not have a 2nd Edition PD Beanie, you have a worthless 6th Edition mass produced PD Beanie. The 5th & 6th Editions Heart Tags are the same with the split paragraph. You have a split paragraph on the Heart Tag that you failed to match properly on this post. I've added the number #401 to the list of mass produced numbered bears. ALL TUSH TAGS WITH STAMPED NUMBERS ARE THE MASS PRODUCED BEARS. Please read all the comments as to why, I've answered this question several times. ANONYMOUS 2/13/12: That's where the Registration Information is located. It should state: REG. NO PA. 1965(KR). Stamped numbers inside the Tush mean it's a worthless PD Beanie. Please read all the comments as to why, I've answered this question several times. PHOEBE HANNAH 2/12/12: Thanks for your comment. Yes, you can reference this website. CHARLOTTE 1/27/12: READ all the comments for your answer, I've answered this question several times. The post states you have a 3rd Edition Bear. DEANIE 1/21/12: #472 a common number & means you have a worthless bear. Just read the post & comments to understand what the numbers on Tush Tags mean. DEANIE 1/21/12: Just match the tags on this post & explain what is different. WAYNE 1/5/12: READ all the comments for your answer, I've answered this question several times. 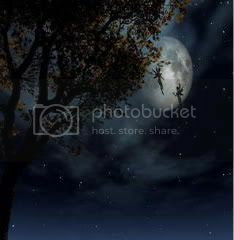 GOLD DUST WOMEN 1/4/12: WOW ~ Now you've given me a burst of energy from your very kind comments. So needed that!!! 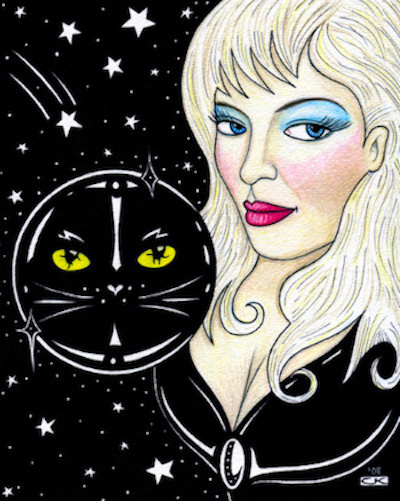 Cosmic Blessings Back At You! NAT 1/1/12: Thanks for the comment: I've added #425. RODNEY BUNKLEY 12/29/11: READ all the comments for your answer, I've answered this question several times. Also, my eGuide Book on PD Beanies will have the information for appraising. RODNEY 12/29/11: READ all the comments for your answer, I've answered this question several times. ANONYMOUS 12/28/11: Thanks for your comment: I've added #447. There are many Internet selling sites other than eBay. You have the dreaded 6th Edition. The 5th Edition's do not have the mass produced assembly line numbers on the Tush Tags. TONJA 11/21/11: READ all the comments for your answer, I've answered this question several times. 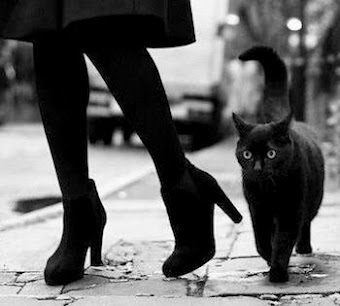 MARIA 11/20/11: Thanks for your comment: #433 is popping up all over the place.